If stuffed cabbage and spaghetti with meatballs had a baby, it would be cabbage with meatballs. Stuffed cabbage, also know as cabbage rolls, is a delicious, classic Eastern European dish, but it takes nearly all day to make. 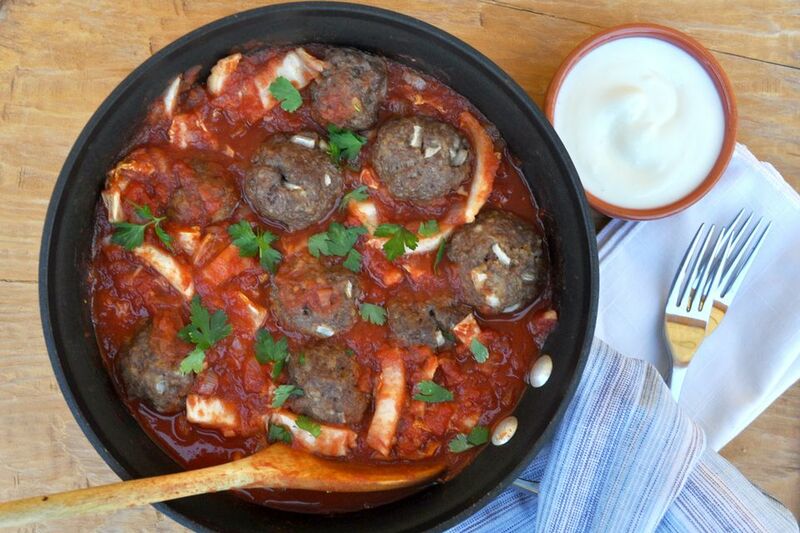 Cut some corners and try something a little different by turning the filling into meatballs and stewing the cabbage directly in the savory tomato sauce. A simple tomato sauce spiked with red wine vinegar and brown sugar slowly simmers along with savoy or Napa cabbage, until tender and flavorful. Meanwhile, meatballs flavored with garlic and paprika bake in the oven (smoked or sweet paprika work well here). The dish has tons of flavor and is lower in carbs than spaghetti and meatballs. Plus, it all comes together in just 45 minutes and is largely hands-off. Cabbage and Meatballs will serve three as a main dish or four as a side. Try serving it with roasted beet salad with crumbled feta for a lighter meal. Add easy barley and mushroom pilaf or Hungarian stuffed peppers and Hungarian fried bread (Langos) for a real Eastern European feast. Just don't forget the sour cream! Heat a large sauce pot over medium heat. Add the oil followed by 3/4 of the onion and 3 minced garlic cloves. Saute for 3 minutes or until the onion is translucent. Add the crushed tomatoes, brown sugar, and red wine vinegar. Season with salt and pepper and stir. Add the chopped cabbage and carefully stir. Bring to a low simmer and cover. Let cook for 30 minutes, stirring occasionally, or until the cabbage is tender. Meanwhile, make the meatballs. In a large bowl, combine the ground beef, remaining 1/4 of the onion, remaining 2 minced garlic cloves, egg, breadcrumbs, Worcestershire sauce, and paprika. Season with salt and pepper and mix well by hand. Form into 1-inch balls and place on a greased large baking sheet spaced evenly apart. Bake for 10 minutes, or until cooked through. Add the meatballs to the cabbage and sauce and serve topped with parsley and sour cream on the side.